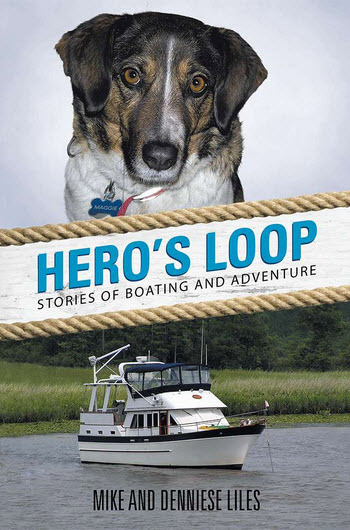 I just finished reading one of the most entertaining books about cruising America's Great Loop since the well-known Ron & Eva Stob's book "Honey Let's Get a Boat". The authors Mike & Denniese Liles did the Loop in 2011 so their book is up-to-date. They took their dog Maggie and much of the book is about the various incidents with Maggie such as jumping overboard to greet a dolphin. Mike suffers severely from Murphy's Law and probably set a new record in both boat and dog problems. All situations are written with lots of humor and no lives were lost. The most frequent problem is "flameouts" which occur when air gets in the fuel line of a diesel engine and the engine quits. We have the same Ford Lehman 120 engine in the Katy Leigh and only once in 16 years have we had a "flameout" which Mike claims is endemic with Lehmans. Mike was having 5 or 6 a day. In our case it was caused on a day we were anchored for hours with the generator going. Since the generator and engine were using the same fuel filter, the generator sucked fuel out of the engine fuel line leaving a bubble and the engine would not start. Generators are never supposed to use the engine's primary filter. We installed a separate filter for the generator and have never had a flameout since. This book is not for picky editor type readers. The book is filled with spelling and English errors. There are also some pages in one chapter where paragraphs are mixed up in the ebook version. Just skip those pages. If you can read without getting wrapped up in the errors you will really enjoy it. However, there is one terrible error which if followed could cause a serious accident. Mike gets mixed up in describing how to overtake a tow or pass a tow. In location 3208 on my Kindle, Mike says "ONE whistle is passing like you would on the highway with a car." The proper way is to remember when the tow captain says to pass on the "one", you turn your boat to starboard or right. If the captain says pass on the two, you turn to port or left. This works whether you are meeting or passing. Mike says exactly the opposite. I wrote to Mike and he has issued a warning on his book's Facebook website quoting my statement above.